I'm teaching another 4 week portrait workshop at Caballero Studio in SE Portland starting in April. We're going to continue our focus on structure and likeness with a greater emphasis on smaller forms and details. The drawing studies will be longer and we'll move from color temperature drawing ( Aux Quatre Crayon ) to drawing with a brush using thin applications of oil paint in monochrome using just one or two colors. I greatly enjoy the transparent monochrome approach because it's an open method that's very forgiving and somewhat akin to watercolor. Thin washes of color are applied over the white of the canvas to create the image. Darks and mid-tones can be rubbed out if they get too dark or the paint too heavy. The image stays malleable throughout the painting session. 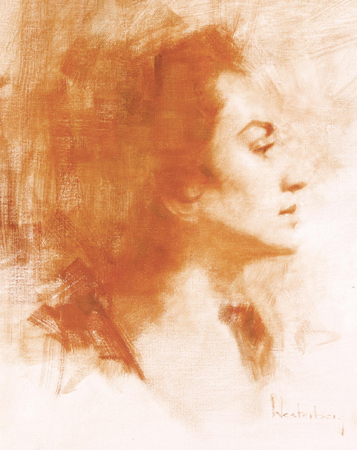 Using a minimum of materials transparent monochrome oil painting is also a great way to practice brush handling and transition from drawing to opaque or alla prima painting. I'm excited to announce that I'll be teaching at Pacific Northwest College of Art for their continuing education program. Stop by on First Thursday! Their newly renovated Beaux Arts Building has been the talk of the town. I will also be spring quarter at teaching figure drawing/anatomy and portrait painting on Monday's at Multnomah Art Center. PNCA Commons, Beaux Arts meets Modern.